Be the first to share your favorite memory, photo or story of Jodi. This memorial page is dedicated for family, friends and future generations to celebrate the life of their loved one. 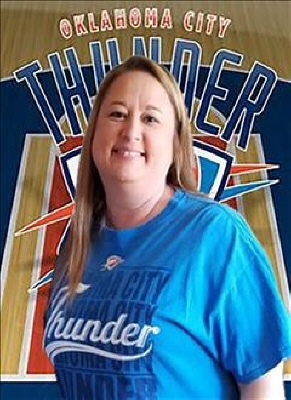 Jodi Lynn (Tritle) Self, 48, passed away March 23, 2019 in Oklahoma City after a brief illness. She was born August 21, 1970, to Douglas and Margaret (Taylor) Tritle in Milford, Delaware. In December 1981 Jodi moved to Altus, Oklahoma. Jodi graduated high school in 1988. She met J.P. Self in 1995. On July 3rd, 2000 they were united in marriage in Vernon, Texas. She started working April 12, 1989 at Wal-Mart in Altus, Oklahoma. She started working in the concession stand and had worked in most of the departments but her final job was claims manager. She loved Wal-Mart and all her co-workers for the last twenty nine years. Besides Wal-Mart she loved Thunder basketball, going to the races, four wheeling, but most of all she loved spending time with her husband and son. She is survived by her husband J.P. Self, Son Jarred Self, Parents Douglas and Margaret (Taylor) Tritle, Father and Mother in law J.O. and Linda Self, Sister in law Kim Self. Numerous aunts, uncles, nieces, nephews, cousins, and friends. Jodi is preceded in death by her infant daughter Jaimee Lynn. In remembrance of Jodi please come in a Thunder shirt or an orange shirt. The family will receive friends 6:30 -7:30 p.m. Thursday March 28, 2019 at Lowell - Tims Funeral Home. Services are 10:00 A.M. Friday, March 29, 2019 at Lowell- Tims Funeral Home Chapel, Altus, Oklahoma. To send flowers or a remembrance gift to the family of Jodi Lynn (Tritle) Self, please visit our Tribute Store. "Email Address" would like to share the life celebration of Jodi Lynn (Tritle) Self. Click on the "link" to go to share a favorite memory or leave a condolence message for the family.